The story of the Apollo Space Program . . . in the astronauts' own words. 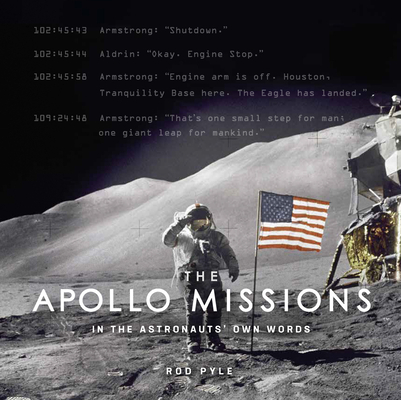 The Apollo Missions tells the spectacular story of the Apollo Space Program through the astronauts' first-person accounts, put into context with commentary by Rod Pyle, a longtime expert on NASA. Landing on the most forbidding environment man had ever experienced, 12 courageous individuals stepped out of their tiny spaceships and onto another world. And with that, the history of humankind irrevocably changed. The adventures live on: with the 50th anniversary of the lunar landings in 2019, we once again gaze moonward. The Apollo Missions contains more than 100 images, many rarely seen, drawn from original NASA film, resulting in a book that transports readers beyond our earthly home. Rod Pyle has written widely about the history of space exploration and the inner workings of NASA. He is a consultant for NASA's Jet Propulsion Laboratory and has worked at Caltech and the Johnson Space Center. Rod has written for the Huffington Post, WIRED, space.com, LiveScience, and many other science periodicals and websites. He is a frequent radio guest on major networks in the USA and UK. His other books for Carlton include Missions to the Moon and Mars: A Journey of Discovery.